C FROM PARIS - I can't tell you how much your comments always mean to me and how they brighten my day! So few people comment at all and yours are always so encouraging! Thank you so much! I'd adore to see anything anyone makes with my gifts. No one has ever shared one. Hint, hint... :) God bless you EXTRA and have a great day! How fun! Imagine being Adam and having the job of making up new words to name every living creature on the earth! I'm actually glad it wasn't my job! Have you ever really thought about the names of each creature and listened to the sound of them? So many of them are just plain funny! LOL and look at some of the animals! There are some way crazy looking creatures out there!!!! God has a great sense of humor! Let's enjoy His blessings and give Him thanks! 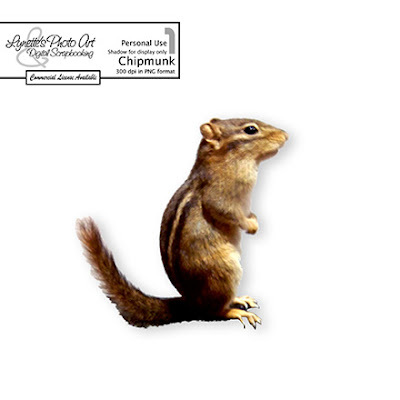 Today I'm giving you the cute chipmunk from the QP I gave you yesterday. If you missed it, it's in the archives in the left column. He's a fun and unexpected element to add to a LO. When I was in high school, my cat had caught a poor little chipmunk. I chased her down to rescue it. I got it away from her without significant damage to the furry little darling when - it bit clean through my finger!!! Man did I put it down fast! (Ummm, I actually threw it without thinking...sorry...was quite a shock!) Turns out they have these LONG CURVED teeth both top and bottom and they MET in the middle of my finger!! LOL! I still think they are adorable, but have a healthy respect for their survival abilities when frightened! What a little cutie. Thanks for sharing the little guy with us. What a little sweetie! Yes they have very sharp teeth! We had a squirrel monkey when I was growing up and when he bit you it was painful. Thanks for the cute element!